I’m always afraid of engaging in a “battle of wits” only half-armed. So I usually choose my debate opponents judiciously. Unfortunately, I recently had a contest thrust upon me with a superior foe: my friend Mark Lowenthal, Ph.D. from Harvard, an intelligence community graybeard (literally!) and former Assistant Director of Central Intelligence (ADCI) for Analysis and Production, Vice Chairman of the National Intelligence Council – and as if that weren’t enough, a past national Jeopardy! “Tournament of Champions” winner. As we both sit on the AFCEA Intelligence Committee and have also collaborated on a few small projects, Mark and I have had occasion to explore one another’s biases and beliefs about the role of technology in the business of intelligence. We’ve had several voluble but collegial debates about that topic, in long-winded email threads and over grubby lunches. Now, the debate has spilled onto the pages of SIGNAL Magazine, which serves as something of a house journal for the defense and intelligence extended communities. 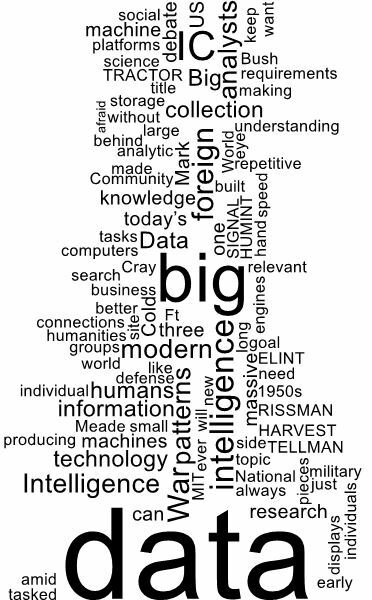 SIGNAL Editor Bob Ackerman suggested a “Point/Counterpoint” short debate on the topic: “Is Big Data the Way Ahead for Intelligence?” Our pieces are side-by-side in the new October issue, and are available here on the magazine’s site. Visit the National Cryptologic Museum in Ft. Meade, Maryland, and you’ll see three large-machine displays, labeled HARVEST and TRACTOR, TELLMAN and RISSMAN, and the mighty Cray XMP-24. They’re credited with helping win the Cold War, from the 1950s through the end of the 1980s. In fact, they are pioneering big-data computers. What do modern intelligence agencies run on? They are internal combustion engines burning pipelines of data, and the more fuel they burn the better their mileage. Analysts and decisionmakers are the drivers of these vast engines, but to keep them from hoofing it, we need big data. Let’s stipulate that today’s big-data mantra is overhyped. Too many technology vendors are busily rebranding storage or analytics as “big data systems” under the gun from their marketing departments. That caricature is, rightly, derided by both IT cognoscenti and non-techie analysts. I personally get the disdain for machines, as I had the archetypal humanities background and was once a leather-elbow-patched tweed-jacketed Kremlinologist, reading newspapers and HUMINT for my data. I stared into space a lot, pondering the Chernenko-Gorbachev transition. Yet as Silicon Valley’s information revolution transformed modern business, media, and social behavior across the globe, I learned to keep up – and so has the IC. Twitter may be new, but the IC is no Johnny-come-lately in big data on foreign targets. US Government funding of computing research in the 1940s and ‘50s stretched from World War II’s radar/countermeasures battles to the elemental ELINT and SIGINT research at Stanford and MIT, leading to the U-2 and OXCART (ELINT/IMINT platforms) and the Sunnyvale roots of NRO. In all this effort to analyze massive observational traces and electronic signatures, big data was the goal and the bounty. War planning and peacetime collection were built on collection of ever-more-massive amounts of foreign data from technical platforms – telling the US what the Soviets could and couldn’t do, and therefore where we should and shouldn’t fly, or aim, or collect. And all along, the development of analog and then digital computers to answer those questions, from Vannevar Bush through George Bush, was fortified by massive government investment in big-data technology for military and intelligence applications. In today’s parlance big data typically encompasses just three linked computerized tasks: storing collected foreign data (think Amazon’s cloud), finding and retrieving relevant foreign data (Bing or Google), and analyzing connections or patterns among the relevant foreign data (powerful web-analytic tools). Those three Ft. Meade museum displays demonstrate how NSA and the IC pioneered those “modern” big data tasks. Storage is represented by TELLMAN/RISSMAN, running from the 1960’s throughout the Cold War using innovation from Intel. Search/retrieval were the hallmark of HARVEST/TRACTOR, built by IBM and StorageTek in the late 1950s. Repetitive what-if analytic runs boomed in 1983 when Cray delivered a supercomputer to a customer site for the first time ever. The benefit of IC early adoption of big data wasn’t only to cryptology – although decrypting enemy secrets would be impossible without it. More broadly, computational big-data horsepower was in use constantly during the Cold War and after, producing intelligence that guided US defense policy and treaty negotiations or verification. Individual analysts formulated requirements for tasked big-data collection with the same intent as when they tasked HUMINT collection: to fill gaps in our knowledge of hidden or emerging patterns of adversary activities. That’s the sense-making pattern that leads from data to information, to intelligence and knowledge. Humans are good at it, one by one. 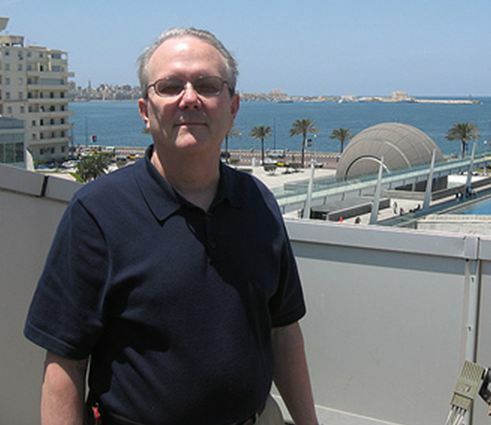 Murray Feshbach, a little-known Census Bureau demographic researcher, made astonishing contributions to the IC’s understanding of the crumbling Soviet economy and its sociopolitical implications by studying reams of infant-mortality statistics, and noticing patterns of missing data. Humans can provide that insight, brilliantly, but at the speed of hand-eye coordination. Machines make a passable rote attempt, but at blistering speed, and they don’t balk at repetitive mindnumbing data volume. Amid the data, patterns emerge. Today’s Feshbachs want an Excel spreadsheet or Hadoop table at hand, so they’re not limited to the data they can reasonably carry in their mind’s eye. To cite a recent joint research paper from Microsoft Research and MIT, “Big Data is notable not because of its size, but because of its relationality to other data. Due to efforts to mine and aggregate data, Big Data is fundamentally networked. Its value comes from the patterns that can be derived by making connections between pieces of data, about an individual, about individuals in relation to others, about groups of people, or simply about the structure of information itself.” That reads like a subset of core requirements for IC analysis, whether social or military, tactical or strategic. The synergy of human and machine for knowledge work is much like modern agricultural advances – why would a farmer today want to trudge behind an ox-pulled plow? There’s no zero-sum choice to be made between technology and analysts, and the relationship between CIOs and managers of analysts needs to be nurtured, not cleaved apart. What’s the return for big-data spending? Outside the IC, I challenge humanities researchers to go a day without a search engine. The IC record’s just as clear. ISR, targeting and warning are better because of big data; data-enabled machine translation of foreign sources opens the world; correlation of anomalies amid large-scale financial data pinpoint otherwise unseen hands behind global events. Why, in retrospect, the Iraq WMD conclusion was a result of remarkably-small-data manipulation. Humans will never lose their edge in analyses requiring creativity, smart hunches, and understanding of unique individuals or groups. If that’s all we need to understand the 21st century, then put down your smartphone. But as long as humans learn by observation, and by counting or categorizing those observations, I say crank the machines for all their robotic worth. Make sure to read both sides, and feel free to argue your own perspective in a comment on the SIGNAL site. I only met David Petraeus once before he came to CIA, in 2006 at U.S. Central Command while he was winding up his tour as commander of the Multi-National Security Transition Command Iraq (acronymically pronounced “minsticky”), and before he took command of MNF-I or CENTCOM, or the war in Afghanistan for that matter. I briefed him on something topical going on (I was still working at DIA at the time) and we certainly didn’t talk long. In fact I came away with only one impression: not so much about him, but about his already-well-commented-on entourage of “Petraeus guys.” He had a reputation as a fast-moving reformer, but it was an outsized group of admirers, I thought, who showed not respect for him, but devotion – even awe. I’m not surprised by the fact that a powerful man was having an affair – heck, I did marry a divorce lawyer after all. The news won’t affect intelligence operations immediately; the professionals at CIA and the intelligence community are still going about their business and tend to look forward to the horizon, not backward. Meanwhile journalists are already delving into the particulars of this peculiar turn of events. Pundits (and the Congressional intelligence oversight committees) will be exploring any linkages or ramifications of this scandal for the Benghazi investigations, and the candidates for Petraeus’s replacement are already making their direct or whisper campaigns known, in emails already bcc’ing around the Beltway. More on that in due time. I only have two observations now, one larger in scope and one quite small, at human scale. The first is the question of what the scandal says about the intelligence security practices in our modern national security state. 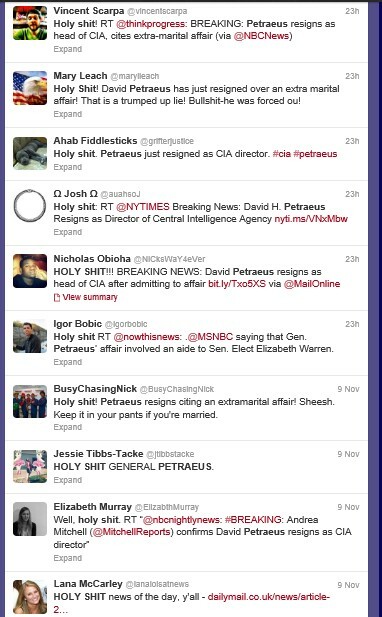 Petraeus held the highest security clearances. He earned the confidence of the President, the trust of his silent warrior employees, the endorsement of the U.S. Senate (94-0!) and the faith of a nation that had cheered his battlefield successes in the Iraq surge and in Afghanistan. Yet the CIA’s confidence in its director was undergirded not only by the Petraeus resume, but by our national security infrastructure of clearances, polygraphs, and professional investigators. Forget the question of one man’s integrity – he was living a lie, big-time, and we missed it. Completely. There will be many questions asked about what that means for other high government clearance-holders, but for now there’s a feeling prevalent in DC akin to what happens when a law-enforcement crime lab discovers shoddy mistakes: all previous convictions are under suspicion and, sometimes, verdicts are reversed. Something to ponder about CIA institutional analytic or operational judgment over the past year…. And what is asked for the service we give? If this time around, it is I that fall. When Petraeus read out that poem, he was standing like Caesar astride a narrow world, a four-star general having “won” two wars in distant ancient lands and commanded USCENTCOM, whose mission area sprawls across Africa, the Middle East and Central Asia. Yet Ramesses is mostly forgotten now, and Shelley’s poem about him captures the fall of great men in a short, powerful sonnet. When I first heard the news about Petraeus from my wife, this is the poem I thought of, and I believe its irony pairs with the lines Petraeus quoted quite sadly.